Last week Senate Republicans passed their budget proposal on a straight party line vote. The Republican plan eliminates local school levies and imposes a $5.6 billion, statewide property tax. Currently, our existing local property tax funds can be spent only in the school districts of the voters who approved them and only on education. 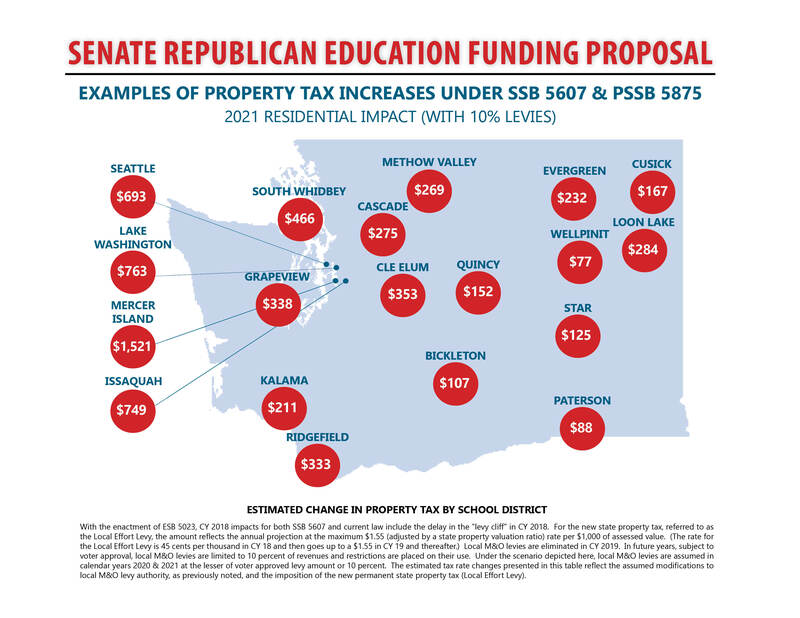 The Republicans’ statewide property tax funds, by contrast, can be used for education (or for any other use, for that matter) anywhere in the state. This isn’t an education plan so much as a property tax plan by another name. The tax shift has expensive consequences for many of our communities. By 2021, homeowners across the state would pay hundreds more per year in property taxes while receiving extremely modest increases in education funding, or in some cases fewer resources than they currently receive. That’s not good for our students’ education and it’s not fair to homeowners. 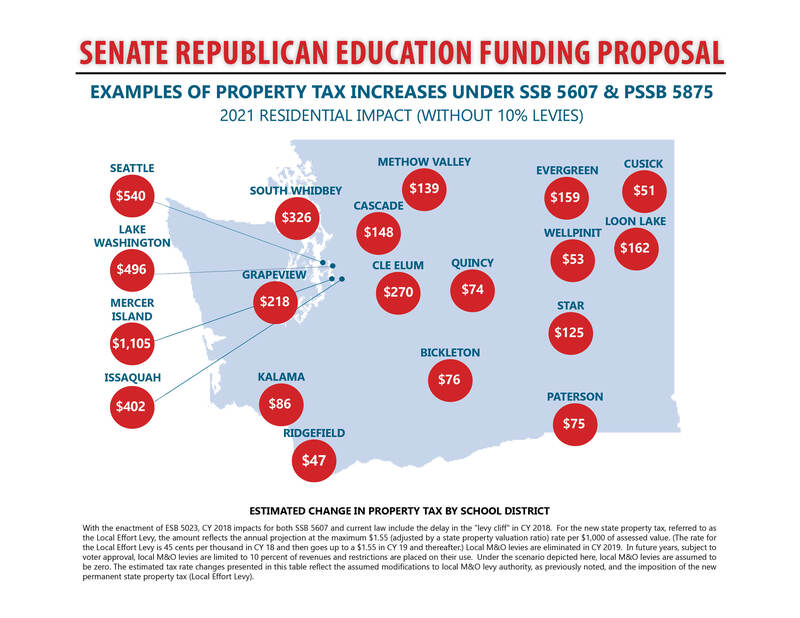 Below are examples of tax increases throughout the state under the Senate Republican K-12 plan, Senate Bills 5607 and 5875. They reflect two options – one if taxpayers vote to approve levy capacity at the 10 percent limit and another if voters reject 10 percent levy capacity. As you will see there are tax increases associated with both choices. Click here to view the impacts for all districts and view data we used to create the maps. “What we saw today was straight out of the Trump playbook. “Republicans unveiled a budget that protects the wealthiest at the expense of those who already are struggling for a seat at the table. “College students, the elderly, poor children, working families, the disabled, the hungry, the homeless – Senate Republicans raid programs aimed at increasing access to college, breaking the cycle of poverty, preparing the youngest kids for success in school and helping working people make ends meet. “Gutting these programs while supporting the largest property tax increase in state history is unnecessary, and simply put, is cold-blooded. “I’d like to thank all of the students, teachers, principals, superintendents, parents, PTA members and everyone who worked tirelessly to finally convince Senate Republicans to relent and work with us to pass this bill. “There was almost literally no student, teacher, family or school district that was immune to the potential devastation a $358 million cut would have had. Today I’m happiest for them. “Now that we have passed the levy cliff bill, it is time to continue our work to fully and fairly fund education. “Senate Democrats are completely dedicated to solving this issue and making sure that all 1.1 million students in our state have access to a world-class education. “I hope Republicans will join us in this endeavor and resist the urge to reach this goal by relying entirely on billions of dollars in property taxes and devastating cuts. “There are 24 Senate Democrats ready to vote ‘yes’ to pass this bill. We need one Republican to join us. “Rather than let a vote happen, rather than see if there is one single Republican out there ready to pass this bill which impacts kids in every corner of our state, Republican leadership decided instead to adjourn. “We believe there is at least one Republican willing to stand against their party and with students, teachers and families all across Washington.